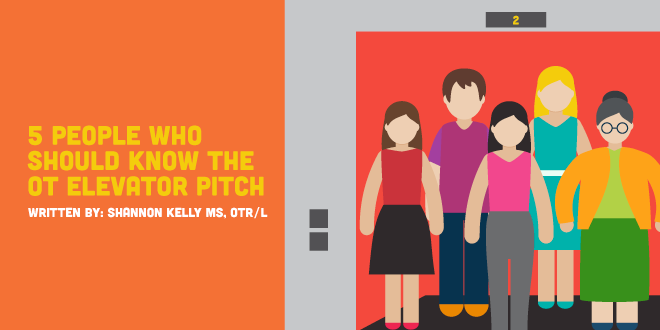 What is your OT elevator pitch? Our profession is in dire need to raise awareness of what is it we actually do and reinforce our distinct value. We are a powerful profession that many do not know about. It is our job as new practitioners to change that, even if it is one person at a time. The best place to start is with your "ripple effect". The people in your network who are closest to you. Plus, with April being OT month, it is the perfect motivator to say loud & proud what OT is. Here is a list of the top 5 people who should know what OT is, as well as a few resources that will make your job of informing them easier. Well, that scenario goes for your sweetheart, too. Chances are good that they will then ask them what exactly ‘occupational therapist’ means. NOW IS THEIR CHANCE! Insert awesome definition here! Awe, parents. AKA the people who LOVE to talk about you most. I guarantee they take any chance they get to brag about how awesome you are. Think of all the people they likely encounter each day: the grocery clerk, gym buddies, co-workers, long lost relatives, and more! These are all perfect opportunities for them to ACCURATELY tell each of their captured audiences what OT is. How frequently do you mindlessly scroll through your feed to get your mind off the stress of your real life, just to look at pictures or videos other people post? Hear me out. What if one of those items for your friends was a short and sweet video on what an OT is? It could have many different results of how it impacts these individuals. It may inspire them to tell someone else about it, inspire a new future OT, give them 60 seconds of entertainment, and ‘use of later’ knowledge. You don’t have to know exactly how your post impacted everyone, just know that it is very likely someone’s life was changed because of you! The same goes for your friends. See the reason for significant others and/or parents/guardians (depending on how good of a friend they are)! Last, but certainly not least, you would likely be very surprised to hear that a lot of other professionals on the rehab team have no stinkin’ clue what OT is! As my level 2 fieldwork project, I had to present to the internal medicine team at a big hospital what OT is and which patients would benefit most from OT services. Just think what a wonderful world it would be if we had the whole team onboard with what OT is. All the referrals. All the happy patients. All the joy! Share a video on Facebook, or send an e-mail to your family with information. Like I mentioned earlier, you may not see the benefits of educating your network about what OT is right away, but it is highly likely your small gesture will make a BIG difference. Quick, easy, and engaging way to educate others!